Tarek Chemaly: Poppins - Corn flakes as a Lebanese national dish? Poppins - Corn flakes as a Lebanese national dish? ...At least the Hummus and Tabboule Guinness book records made cultural sense because of Israel trying to appropriate them as national dishes. So these - the aforementioned records fed on (bad pun!) the nationalistic fault line in Lebanon's seismic ego. But two world records of corn flakes, well, I am not so sure. If we are trying to culturally appropriate the corn flakes as a national dish, then logic there is. 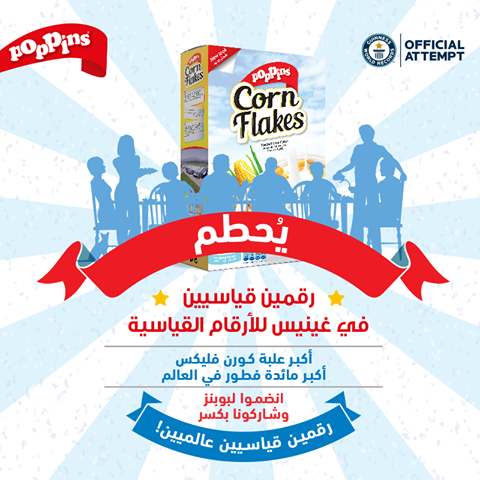 But breaking the world records of the biggest Corn Flakes box and the biggest corn flakes breakfast (to be held in the old Jounieh Souk on October 2nd) s not something I had anticipated. Still, good luck for us, and if some town in Illinois comes back biting, you better be forewarned.